The Maya civilization is a Mesoamerican civilization, noted for the only known fully developed written language of the pre-Columbian Americas, as well as its spectacular art, monumental architecture, sophisticated mathematical systems and extremely accurate astronomical observations. Their charts of the movements of the moon and planets are equal or superior to those of any other civilization working from naked eye observation. For reasons which are still much debated, in the 8th and 9th centuries AD Maya culture went into decline, with most of the cities of the central lowlands abandoned. Detailed monumental inscriptions all but disappeared. Among the many types of Maya calendars which were maintained, the most important included a 260-day cycle, a 365-day cycle which approximated the solar year, a cycle which recorded lunation periods of the Moon, and a cycle which tracked the synodic period of Venus. The Maya calendar is actually a system of distinct calendars and almanacs. The Maya utilized a highly accurate measure of the length of the solar year, far more accurate than that used in Europe as the basis of the Gregorian Calendar. They did not use this figure for the length of year in their calendar, however. Instead, the Maya calendar(s) were based on a year length of exactly 365 days, which means that the calendar falls out of step with the seasons by one day every four years. By comparison, the Julian calendar, used in Europe from Roman times until about the 16th Century, accumulated an error of one day every 128 years. The modern Gregorian calendar accumulates a day's error in approximately 3257 years. Philosophically, the Maya believed that knowing the past meant knowing the cyclical influences that create the present, and by knowing the influences of the present one can see the cyclical influences of the future. katun = 20 tun cycles or 7200 days. It is the 2nd digit on the Maya long count date. For example, in the Maya Long Count date 12.19.13.15.12 (December 5, 2006), the number 19 is the katun. 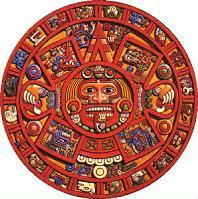 A baktun is 20 katun cycles of the ancient Maya Long Count Calendar. It contains 144,000 days or 400 tuns or nearly 400 tropical years. The Classic period of Maya civilization occurred during the 8th and 9th baktuns of the current calendrical cycle. The current (12th) baktun will end on December 20, 2012 (using the GMT correlation). The 13th baktun will be completed (13.0.0.0.0 in Long Count notation) on December 21, 2012, which also marks the beginning of the 13th baktun, as such a term is usually used among Mayanists. The end of the 13th b'ak'tun is conjectured to have been of great significance to the Maya. It does not necessarily mark the end of the world, according to their beliefs, but a new beginning or time of re-birth. According to the Popol Vuh, a book compiling details of creation accounts known to the Quiché Maya of the colonial-era highlands, we are living in the fifth world. The Popol Vuh describes the first four creations that the gods failed in making and the creation of the successful fifth world where men were placed. A solstice is either of the two events of the year when the sun is at its greatest distance from the equatorial plane. The name is derived from Latin sol (sun) and sistere (to stand still), because at the solstice, the Sun stands still in declination, that is, it reaches a maximum or a minimum. The term solstice can also be used in a wider sense as the date (day) that such a passage happens. The solstices, together with the equinoxes, are related to the seasons. In some languages they are considered to start or separate the seasons; in others they are considered to be center points (in English, in the Northern hemisphere, for example, the period around the June solstice is known as midsummer, and Midsummer's Day is the 24 June — now two or three days after the solstice). The Winter Solstice will occur at 11:11 am Universal Time on December 21, 2012. The 'Message of The Sphinx' with the Sphinx being a type of "clock" telling the "First Time" and the "Last Time." And the "Last Time" will occur that day at 11:11 pm Cairo/Giza time - or 9:11 pm Universal Time. The fact that the Winter Solstice occurs that day at 11:11 am clocks the year 2012 into place.